Cooking in someone else's kitchen: What? And why? My self-imposed task today is to sort out our utility/mud room which has become a repository for all kinds of junk. Some of it (most of it) is our junk, but in my clearing-up I've also found previous-owner junk. This object is one such item. 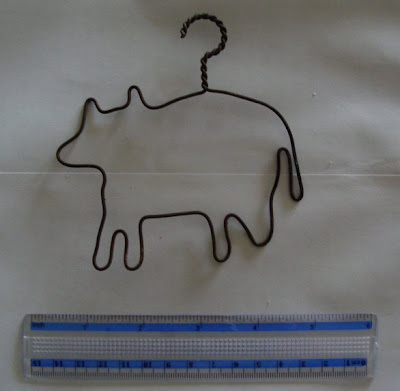 It's a small coat-hanger style hook, about five inches wide. I think it's supposed to be in the shape of a cow, but that is guesswork based on the fact that this used to be a beef-cattle farm. What would/should this be used for? Clearly, someone put a fair amount of work into making it, which makes me feel bad about throwing it away, but I really can't think what else to do with it. Answers in the comments, please: and if anyone would actually like to own this object, please shout! It's probably meant to be some sort of rustic, country style decoration :) Have fun sorting through all your junk! By the way, I wanted to mention that I'm having a Christmas giveaway this week. If you're interested in participating you just need to enter by Dec. 3rd. It should be fun! I think it is quite cute - could you use it to hang (small) scarves on, or garlic? Hmmm. It does have its own sort of charm, but as you seem not to be under its influence, how about ties? Belts? (Actually, garlic sounds best, as K pointed out.) Let us know what you decide. Well you've all made me feel that this objet d'art deserves a second chance. It's a bit rusty, so maybe not ties, but belts might be an option, and if my garlic comes to anything this year, that might work too. Thanks for the suggestions! I think that you could leave it in the mudroom and use it for scarves or maybe even put a few clips on it for hanging up keys? It is cute in a porcine way, perhaps it's a pig?